getcalc.com's distance between 2 points calculator is an online basic geometry tool to calculate length between two points (x1, y1) & (x2, y2) on the straight line. To generate work for homework or assignment problems or to check how to find the distance for any custom input values, supply the corresponding input values to this calculator and hit on the ENTER button. Distance between Two Points is a length between point (x1, y1) & point (x2, y2) on the straight line. The below mathematical formula is being used in this calculator to generate the work or validate the custom input values of assignment or homework problems on finding the distance between 2 points. 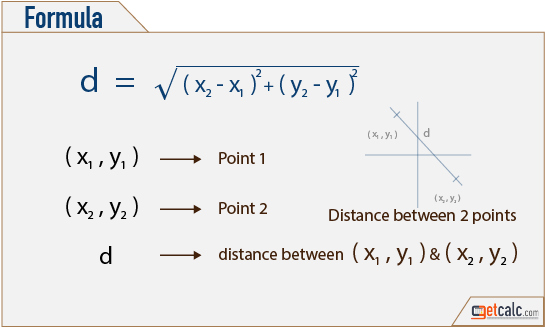 K-12 students may refer the below formula to know what are all the parameters are being used to find the distance between 2 given points on a straight line.